Over the last decade there has been a notable shift towards interdisciplinary engagements across art, design and STEM in research, educational and public engagement contexts. Interdisciplinary problem solving is increasingly touted as an essential mechanism to address ‘wicked problems’ such as climate change . Indeed, many major universities in Australia (including QUT, UTAS, UTS and the University of Melbourne) have formally integrated inter (and trans) disciplinarity into their institutional vision and research agendas. Implementation remains a far greater challenge. While interdisciplinary collaborations provide an important avenue to address social issues and drive innovation, the arts and design remain marginalised within tertiary and secondary educational settings. This could be attributed to the ongoing focus on STEM disciplines within the National Science and Innovation Agenda in Australia , and similar innovation and ‘economic future proofing’ policy strategies and reports in operation in the US [3, 4] and Europe . Indeed, when included in STEM discussions and within an innovation context, the arts and design are too often regarded as ‘STEM service’ disciplines, whose primary value is facilitating science communication, or providing activities that support the development of STEM skills by making science and technology ‘fun’. This perspective is fundamentally problematic for both STEM and arts disciplines, as it mistakenly implies that creativity and ‘fun’ are not inherent traits of science and technology and that art and design are not crucial components for future thinking. In addition, siloed organisational structures within universities make interdisciplinary research difficult. There are also conflicting agendas and numerous inconsistencies regarding how key terms are understood and applied, within and across institutional contexts. Non-traditional research outputs are also poorly understood within the science, engineering and technology disciplines. With the complexity of ‘wicked problems’ demanding interdisciplinary teams, there is an urgent need to challenge the national discourse, address organisational issues, and critically assess the value and potential of critical alliances across art, design, science and technology. The Critical Connections symposium was held at Queensland University of Technology’s (QUT) Creative Industries Precinct (March 2017). Co-sponsored by the Centre for Regenerative Medicine (QUT) and the Creative Exchange Institute at the University of Tasmania (UTAS), the symposium provided a platform for thinkers working across art, design and STEM to articulate key issues and share interdisciplinary strategies, via four panels: Research, Learning & Teaching, Ethics, and Cultural Engagement. It sought to bridge the divide between research, secondary and tertiary education, and public outreach programs to provide greater awareness about how different sectors engage across disciplinary terrains. This article provides an overview of each panellist’s key arguments and insight into current viewpoints that require further scrutiny. In summarising insights, the article signals the need to continue discussion across research and educational terrains to identify strategies that enable ongoing interdisciplinary exchange and effective evaluation mechanisms to ensure inclusive and best practice models are adopted. The symposium began with a keynote by Oron Catts, director and co-founder of SymbioticA (a dedicated art and science laboratory and a Centre of Excellence in the Biological Arts at the University of Western Australia), and professor of Contestable Design at the Royal College London. Catts is also acknowledged internationally in the art and science terrain, and highly critical of interdisciplinary developments that fail to recognise the economic and political forces directing STEM research trajectories. As one of the pioneers of cell and tissue culture art, Catts has worked as an artist in the biomedical and bioengineering arena for over two decades. In particular, his work (much of it in collaboration with Dr Ionat Zurr) focuses on the need for a critical re-evaluation to probe and reveal the ethical and political implications raised by the technological intervention into living systems. 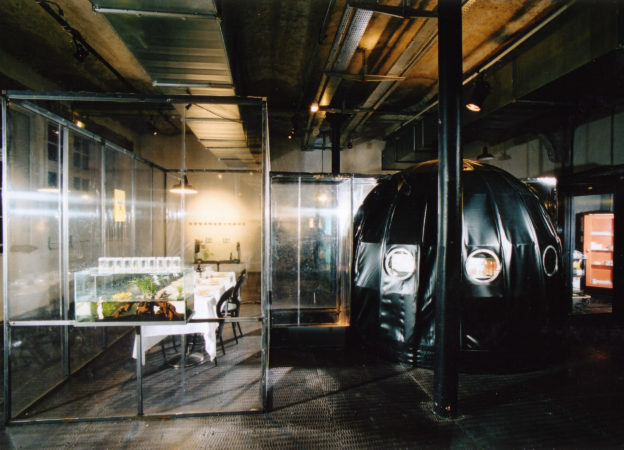 For example, their project Disembodied Cuisine (2003), explored the potential of creating ‘victimless’ meat using tissue culture techniques . In developing a small tissue engineered ‘steak’ from bio-degradable polymer and frog cells, the project revealed that cell culture still depends on the use of animal products. In his view, concepts of ‘victimless’, often entail mechanisms of distance and abstraction that simply hide the victims more effectively. Hands on experimentation and engagement with scientific processes and biotechnologies are central to their practice and seen as crucial for developing the language and understanding to effectively critique the problematic assumptions that underpin contemporary biomedical technologies. It is also a perspective that underpins the philosophy of SymbioticA, as resident artists and graduate students must actively engage with the tools and subjects of their research. Providing access to cutting edge scientific facilities, not only facilitates a more in-depth understanding of scientific processes, but also enables researchers from the arts and humanities to experiment with new materials and develop methodologies that test and challenge disciplinary assumptions. While Catts’ lecture provided insight into the seminal creative works produced by Catts and Zurr over the past twenty years, the presentation also highlighted some of the ethical and philosophical issues surrounding the use of living and autonomous systems. Citing the work of historian Yuval Noah Harari, Catts argues that Western culture largely operates within a 19th century conceptual and philosophical framework rooted in the Industrial Revolution which sees ‘nature’ and living systems as material for our use, exploitation and control. He argues that these value systems are not only unsustainable and position humans and technologies outside of nature, they also inherently replicate systems of violence. In drawing attention to some of these issues, Catts’ lecture pointed towards the role of the artist in the biotechnology debate. Artists, he asserts, have different ‘social contracts’ to scientists. They can take risks, re-purpose and rethink (bio)materials using a variety of mechanisms (including fiction), to critique ontological and epistemological frameworks and systems of power. Free from the industry and corporate interests that govern scientific research, the artist is also able to reveal failures and the limitations of technological progress, to ‘find the symptoms in the solutions’ and contest problematic techno-scientific trajectories. By working as an outsider within a formal laboratory, the artist can also help demystify biotechnologies and confront the viewer with technological realities. As such, the artist is positioned as a disrupting force and provocateur, and not science communicator.